Sometimes you need to keep track of something about the people you know but you don’t already have a line (or field) for it on your Address List. For example, if your job involves selling merchandise to retail stores, your Address Book probably contains the names of all the store buyers to whom you sell. The Address Book includes four lines at the end of the Address Edit screen that you can rename to fit your needs. These four lines are called custom fields. You may want to set up one custom field to keep track of the type of merchandise that each customer buys, such as housewares, appliances, and shoes. You can rename one of the custom fields to Specialty to show each buyer’s area of interest. 1. With the Address List visible, tap the Menu soft button at the bottom of the display area. The menu bar appears at the top of the display area. 2. Choose Options –> Rename Custom Fields. The Rename Custom Fields dialog box opens, as shown in Figure 1. 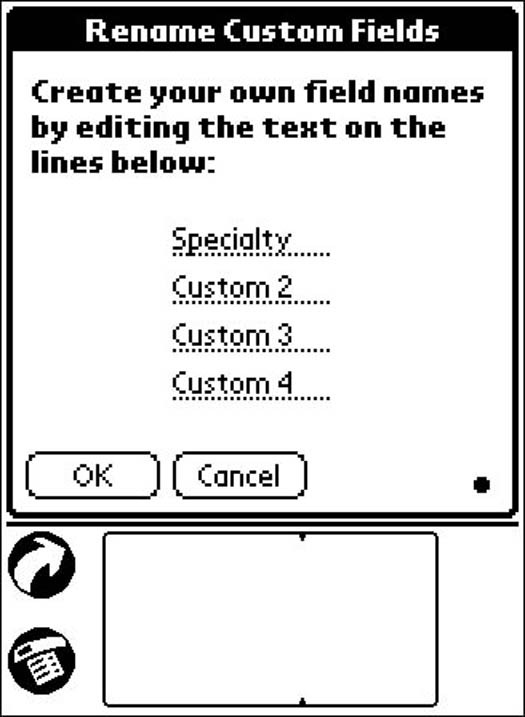 Figure 1: Just replace the name Custom 1 with the field name of your choice. 3. Select the field that you want to rename. The text that you select is highlighted. 4. Enter the name that you want for the field with either the on-screen keyboard or Graffiti. The text that you enter appears as the new field name. 5. Rename the other custom fields by following Steps 3 and 4. 6. When you’ve renamed all the fields that you want to rename, click OK. The Rename Custom Fields dialog box closes, and the Address List reappears. You don’t have to rename custom fields to use them. You can just enter information in the fields and remember that the field named Custom 1 contains a certain type of entry. Renaming the custom fields just makes them a little more useful and easier to understand. When you rename a custom field, the field name is changed in all address records.